Shuftharz is an Orc blacksmith living in Mor Khazgur. She will only trade with you if you are Blood-Kin to the Orcs. She will also buy Orichalcum ore if you have any. 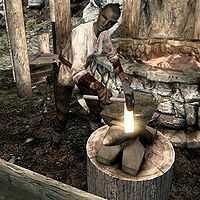 Shuftharz lives much of her life dedicated to working the forge at the Stronghold. She wakes up at 8am and immediately heads to the forge. She works at it for twelve hours, offering her various services. After a long day of working hard at the forge, she will head inside Larak's Longhouse at 8pm for a four hour dinner. After finishing her dinner, she will head to bed at midnight and resume her schedule the next day. Shuftharz wears a set of miner's clothes along with a pair of gloves and boots. She carries the key to Larak's Longhouse and a selection of common loot and gold. She also carries a variety of weapons, including a leveled mace, bow, and 20 arrows, all of which can be up to Orcish in quality. While she's at the forge offering her services, Shuftharz will be quick to offer her services to you: "You need some armor, outlander?" She will then provide a recommendation: "How about an axe? Malacath smiles on the axe-wielder." When she's not at the forge, she will tell you to come back the next day: "We can trade in the morning, outlander." At any time, she will tell you about how content she is with her life at Mor Khazgur: "The forge is strong and so is our chief, Larak. I'm content." She will also proudly tell you about the success her son, Olur, is having with working the forge: "My son, Olur, learns the forge well. His work brings me pride." This is the merchandise found in Shuftharz' merchant chest. These items are only available if purchased from the merchant; they cannot be pickpocketed or stolen. They are restocked every two days. This page was last modified on 3 June 2013, at 20:04.